Bring out the best in your pal with the Go! Solutions Skin + Coat Care dry dog food. 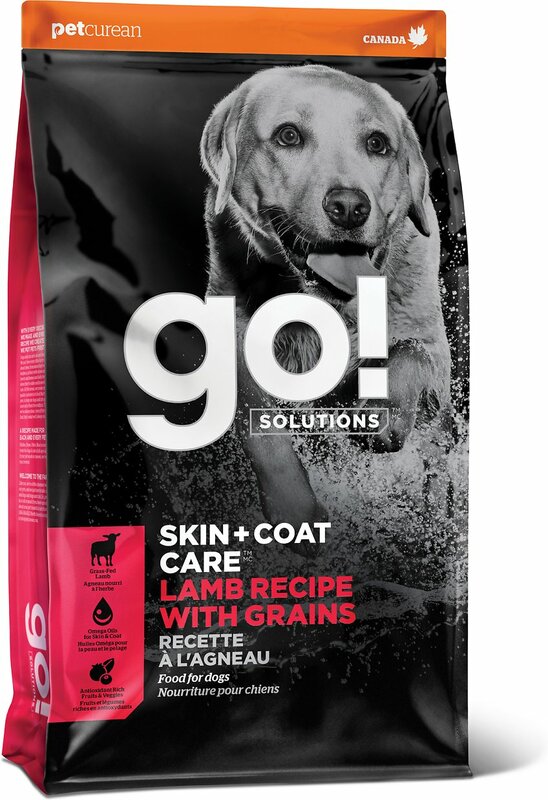 Formulated with premium quality, lamb meal as the first ingredient, it provides your pup with essential amino and omega acids to support her healthy skin and a lustrous coat. It's made with zero corn, wheat, soy or by-products, and a single source of animal protein, which makes this solution ideal for dogs with certain sensitivities. And because limited doesn’t mean skimping on flavor or nutrition, each bite is loaded with hearty ingredients like lentils, apples and carrots, plus essential vitamins, minerals, antioxidants and probiotics. So, get furry, set, go! 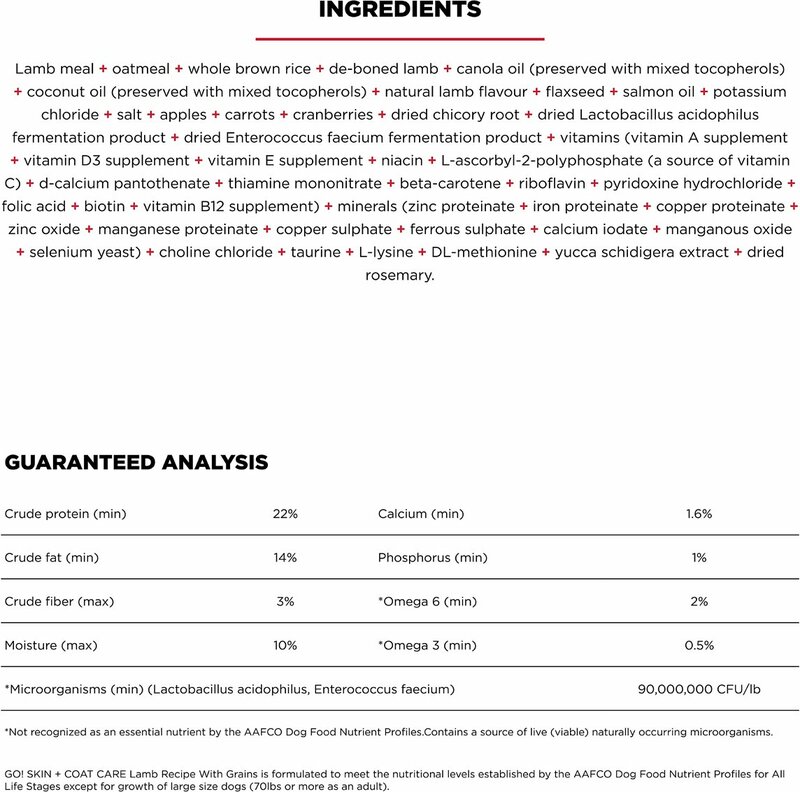 Lamb Meal, Oatmeal, Whole Brown Rice, De-Boned Lamb, Canola Oil (Preserved With Mixed Tocopherols), Coconut Oil (Preserved With Mixed Tocopherols), Natural Lamb Flavor, Flaxseed, Salmon Oil, Alfalfa, Potassium Chloride, Sodium Chloride, Apples, Carrots, Cranberries, Dried Chicory Root, Dried Lactobacillus Acidophilus Fermentation Product, Dried Enterococcus Faecium Fermentation Product, Vitamins (Vitamin A Supplement, Vitamin D3 Supplement, Vitamin E Supplement, Niacin, L-Ascorbyl-2-Polyphosphate (A Source Of Vitamin C), D-Calcium Pantothenate, Thiamine Mononitrate, Beta-Carotene, Riboflavin, Pyridoxine Hydrochloride, Folic Acid, Biotin, Vitamin B12 Supplement), Minerals (Zinc Proteinate, Iron Proteinate, Copper Proteinate, Zinc Oxide, Manganese Proteinate, Copper Sulphate, Ferrous Sulphate, Calcium Iodate, Manganous Oxide, Selenium Yeast), Choline Chloride, Taurine, L-Lysine, Dl-Methionine, Yucca Schidigera Extract, Dried Rosemary. With all the great reviews I was very hopeful about this food. Gradually switched over, however once totally on this my dog didn’t do well on this at all. Had to come back online and order something else immediately. What a waste of money. Just goes to show not everything is for every dog. Half way through this bag and so far, so good. I'll be ordering a second bag to see how this food sits with our dog. We have a 12 year old, 15 pound beagle who has reflux and a pea allergy. It's been difficult to find high quality kibble that doesn't include peas. Our dog eats this up without a problem and has been producing normal looking stools with the transition to this as her main meal. This brand was recommended to me by my son. It has improved the dog's coats which are now shinier than they were before I used this brand. They love the flavor as well. I served this to my English Bulldog and Golden Retriever Puppy, who eats EVERYTHING voraciously... food for sure but also sticks, acorns, magnolia leaves. He wouldn't even touch this food. Neither of my dogs would touch this food. I've used this company for dog food before with great results. Don't know what happened with this batch. Other than the pea product, the rest of the ingredients are great for our Callie who has allergies to other food ingredients. She seems to like it very much which was important. The smaller, 6 lb. color was different than the 12 lb. I ordered. I just hope nothing has changed in the food. Would like to see a "use by date" somewhere on the bag. Could not find it. I've been buying dog food from our vet. But chewy is more reasonable and very convenient. I don't have to make that extra trip every 2 months !! Love this food and the dog loves it too. Always has a fresh smell when opened and has a type of closure on the bag so you can close it for freshness. I love dog food that is made in Canada as their ingredients seen to be so much better than what is somewhat said to be made in the USA. Lots of manufacturers still buy their ingredients from China, a big no no when shopping for quality dog food.